Create a culinary presentation that is pleasing to the eye with this bamboo skewer holder. Measuring at 16.5 inches long and 8.8 inches wide, this cocktail pick holder is designed to hold 20 skewers on either side. The natural finished look serves as a clean and organic backdrop to all of your sweet and savory appetizers. Line up skewers of mini shish kebabs straight from the grill or create vegan skewers with colorful vegetables served hot or cold. 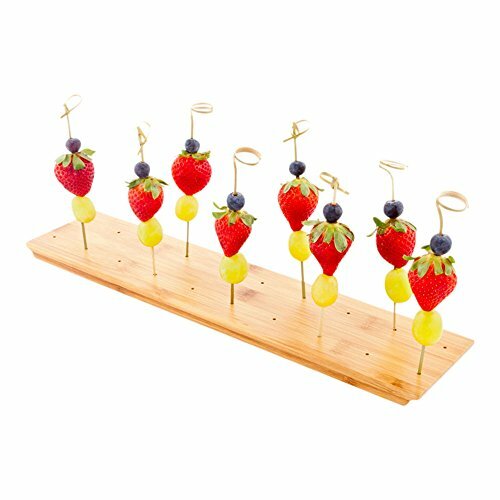 This skewer holder also makes an attractive confectionary display of soft gourmet caramel and other soft candies. Prep delicious decorative skewers of foods to dip through a white or dark chocolate fondue fountain. Prep cocktail garnishes for guests to choose from or set them up for mixologists for a more efficient service. You will receive one Bamboo Reversible Skewer Holder per order. DECORATIVE DISPLAY HORS D'OEUVRES: Create a show-stopping culinary attraction using these skewer displays for fondue fountains, buffets, mixed cocktail drinks, and more! IDEAL FOR SWEET AND SAVORY BITES: This stand is great for both chefs and bakers to display delicious bite-sized appetizers and desserts! GREAT FOR ANY OCCASION: Use this bamboo skewer stand to display tasty hors d'oeuvres at cocktail happy hours, weddings, birthday parties, corporate mixers, and other events! MADE OF ORGANIC BAMBOO: Made of sustainable bamboo, an eco-friendly, biodegradable plant. Hand wash only. Dry thoroughly. Do not clean in the dishwasher. PRODUCT DIMENSIONS: 16.5 inches L x 3.8 inches W; 20 skewer holes. Made of bamboo. Natural bamboo surface.